Weather in New York is anything but predictable these days, with 60-degree days followed up by below-freezing winds. But while fluctuating temps have been irksome, we’ve found a fun little gadget that makes unpredictable weather a serene and beautiful thing. 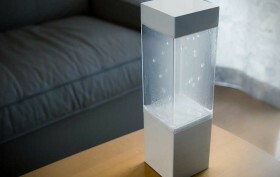 Meet Tempescope, an ambient physical display devised by Ken Kawamoto that physically visualizes impeding weather conditions like rain, clouds and lightning. The minimal device is designed to receive weather forecasts from the Internet and reproduce the next day’s sky inside your home.